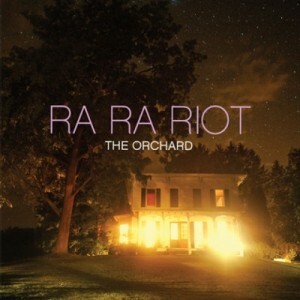 Ra Ra Riot’s sophomore effort The Orchard is a step in the right direction for the band, trading the catchy pop choruses on The Rhumb Line for introspective lyrics about their own personal lives and how they have grown and developed. The soaring instrumentals and soft, reflective cooing from Wes Miles demonstrate strong musicianship from the band, but the album fails to impress holistically. There is no doubt in my mind that the members of the band are incredibly talented with their individual instruments, but as a whole, Ra Ra Riot seems unable to combine these talents together as a cohesive unit. The creative bass lines, although quite intricately played, seem to have been turned up way too loud and distract from the other instruments. In the first two tracks, “The Orchard” and “Boy,” the boosted bass line is quite noticeable, and opens the album on a rather bad note (pun not intended). Otherwise, “Boy” is a touchingly reflective song and a great choice for first single. The signature orchestral lines from cellist Alexandra Lawn and violinist Rebecca Zeller are stylistically brilliant, especially when combined with the energetic guitar playing from Milo Bonacci. The drums from Cameron Wisch keep the songs moving along at a decent pace, even though The Orchard features some of Ra Ra Riot’s slowest ever material. “Too Dramatic” is a bright, poppy song, standing out from the comparatively somber first two tracks. Directly after “Too Dramatic,” “Foolish” once again returns to the slower, more thoughtful sound that pervades The Orchard as a whole and ultimately drags it down. As a whole, the record feels sluggish and lethargic, even when the band launches into moments of orchestral beauty. At times, vocalist Wes Miles seems to be a dulled down version of Vampire Weekend’s lead singer Ezra Koenig. In fact, “Massachusetts” could almost be a Contra B-side. “You And I Know” features the voice of cellist Alexandra Lawn, which is touching lyrically and a breath of fresh air sonically. Unlike their debut The Rhumb Line, The Orchard offers little variety between songs, making the album less intriguing to first time listeners. Instead of the vibrant energy found on The Rhumb Line, Ra Ra Riot takes time to build up the momentum on each song, before launching into lulling, orchestral perfection. Altogether, the album remains rather drab and fails to really hook the listener. It is certainly an album that grows on you after multiple listens, but The Orchard is in no way, shape or form, a classic. It is, however, a big step forward for the band and hints at an extremely bright future for the already successful young band. Listen: Leann Grimes - "Yeah We Up"